What the ethically trading Co-op has done is to extend its boycott of goods produced in illegal settlements on Palestinian territory to four Israeli suppliers who refuse to guarantee that their produce doesn’t come from such illegal settlements. It will continue to trade with Israeli suppliers that do not source from the settlements, and currently has supply agreements with some 20 Israeli businesses. What’s more ethical — selling products produced in illegal settlements that are an obstacle to peace? or refusing to sell them? No contest really. But that’s too much for Luke who is employed by BICOM (the Britain Israel Communications & Research Centre) to run a ‘grassroots’ campaign against such boycotts and campaigning to “create a more complete understanding of Israel and its situation“. Throughout history the Jewish people have been subjected to boycotts by host communities, culminating in the Nazi boycott of Jewish shops and businesses. Anything that carries echoes of that by boycotting Israeli businesses is understandably incredibly distressing for Jewish people. Why does Luke Akehurst resort to the utterly inappropriate tactic of invoking the Holocaust? He says its because it offends British Jews who are sensitive because of the history of Nazi anti-Jewish boycotts in the 1930s. Does he not think that there are British Jews who are offended by using the Holocaust to denounce an ethical trading policy of the Co-op? The fact is that though almost three-quarters of British Jews may regard themselves as Zionists, about three-quarters also oppose the establishment of illegal settlements in occupied Palestinian territory. The Co-op’s boycott could not be better designed: it is specifically targetted at illegal settlements that are almost universally condemned. The arguments against generalised anti-Israel boycotts used by Luke and others employed to undertake PR effectively in support of the Israeli government are simply not relevant to those at illegal settlements. And they will hurt illegal settlements financially. Rightly so. Boycotts have an honourable tradition amongst Jews. 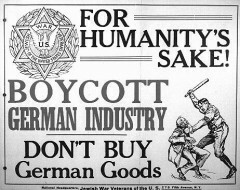 In 1933 in the US, the American Jewish Congress, American League for Defense of Jewish Rights, B’nai B’rith, the Jewish Labor Committee and Jewish War Veterans — joined together in a call for a boycott of German goods backed by the President of the AFL (US trade union confederation) and political leaders. And in modern times: two months ago, Avraham Burg, former Chairman of the Israeli Knesset, of the Jewish Agency (that oversees Jewish immigration to Israel) and the World Zionist Organisation (the umbrella for the world Zionist movement since 1897) explained why he supports the boycott of settlement goods in the Independent. Could it be relevant, by the way, that the biggest funder of his employer BICOM, Poju Zabludowicz, a London-based Israeli billionaire arms dealer who also heavily funds the Conservative Party, has substantial property interests in the illegal West Bank settlement of Ma’ale Adumim? So how should a Jew react to Jewish Apartheid? Posted in: International, Middle East/North Africa, Shopping. John Reid: How can the comparison to the Holocaust be both excessive and right? It was either a legitimate metaphor or it was offensively over the top. Which was it? If you read the article in full (or knew anything at all about the case) you would know that the Co-op have boycotted illegal settlement goods, not Israeli goods or Jewish goods in general. So far as I know the Co-op don’t sell any ‘Tibet goods’, but feel free to take it up with them. Also, Luke Bozier wasn’t forced out. He decided to defect to the Conservative Party because he is a Tory.